PEP EXCLUSIVE: What are the plans of FDCP for the 2014 Sineng Pambansa? 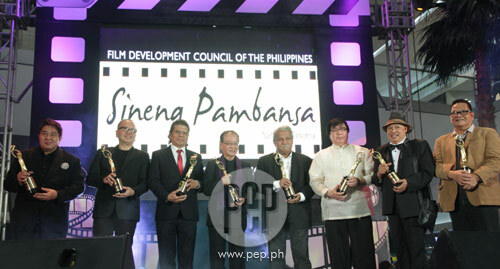 During the first quarter of 2013, the Film Development Council of the Philippines (FDCP) formally introduced the directors who will be part of the Sineng Pambansa National Film Festival All Masters Edition. The initial list included Elwood Perez, Romy Suzara, Jun Urbano, Gil Portes, Maryo J. de los Reyes, Mel Chionglo, Tikoy Aguiluz, Joel Lamangan, Carlos Siguion-Reyna, Jose Javier Reyes, Chito Roño as well as the directorial tandem of Peque Gallaga and Lore Reyes. They were given a grant of P1.5 million and the "artistic liberty" to create their dream projects. Veteran director Celso Ad. Castillo was also informed that he would be part of the All Masters Edition but he passed away in November 2012. Carlitos Siguion-Reyna backed out from the film fest because he said he could not finish his film on time. Jun Urbano also backed out and in an interview with PEP.ph, he admitted that he had trouble raising counterpart financing for his entry titled The Winged Gladiator. As a result, the following directors remained: Elwood Perez (Otso), Romy Suzara (Tinik), Gil Portes (Ang Tag-araw ni Twinkle), Maryo J. delos Reyes (Bamboo Flowers), Peque Gallaga & Lore Reyes (Sonata), Mel Chionglo (Lauriana), Chito Roño (Badil), Tikoy Aguiluz (Eman), Joel Lamangan (Lihis), and Jose Javier Reyes (Ano Ang Kulay ng Mga Nakalimutang Pangarap?). In addition, the FDCP also managed to include the final obra of the late Celso Ad Castillo titled Bahay ng Lagim. Taking place in a convent, the film follows the story of Sister Sofia whose life takes a grave turn upon the arrival of the troubled and haunted Fatima. It stars Karel Marquez, Jaclyn Jose, Bing Loyzaga, and Ronnie Lazaro, among others. The 2013 Sineng Pambansa National Film Festival All Masters Edition is set to run exclusively at all SM Cinemas from September 11-17. Was Direk Celso Ad. Castillo able to complete principal photography for Bahay ng Lagim? Mr. Granados: "Oo [nashoot niya lahat] pero rough edit lang ang nagawa. We did the final edit and the CGI [computer graphics]. "Ang nagsupervise ng final edit ang assistant director niya at ang traditional editor, yun ang tumapos. "We sought proof that Direk Celso made the film and nasa amin ang mga rushes. Yung boses niya maririnig at makikita siya sa shooting." What was the last message of Direk Celso about his film? Mr. Granados: "Meron siyang documentary na five minutes. Ipapakita siya sa mga second venues." It was previously reported by another media outfit that Derek Ramsay was supposed to play activist poet Emmanuel "Eman" Lacaba in Direk Tikoy Aguiluz's Eman. Was Derek able to shoot scenes for the biopic Eman? Mr. Granados: "Dapat si Derek Ramsay. Kaya nadelay ng husto ang project niya kasi dapat si Derek but ang schedule ni Derek is so tight." After September 17, will the movies continue to screen in SM Cinemas? Mr. Granados: "Marami pang areas na hindi covered ng SM so pupunta ng Robinsons...After that week, ipapalabas na sa ibang cinemas. "Kung mayroong request ng extension, based sa demand ng audience, mage-extend siguro sila." Aside from these films helmed by veteran directors, the FDCP decided to include a movie helmed by TM Malones. The FDCP describes TM Malones' film, Salvi: ang Pagpadayon, as follows: "In a post-apocalyptic Philippines, a disease is running rampant, infecting and killing thousands. Women, the primary carriers of the illness, are being gathered and rounded up into concentration camps to minimize the spread to the country. The population is at risk as the disease is spread through sexual activity. Only a handful of women are allowed to give birth, while a grimmer fate awaits the others. Salvi, a determined and tough survivor, roams the wastelands of the Philippines searching for the sister that has been taken away to a concentration camp. Countless dangers and troubles are apparent thoughout the journey, but Salvi will stop at nothing to reclaim the missing family member." Why did they decide to include TM Malones' full-length film titled Salvi as part of this Sineng Pambansa? Mr. Granados: "[TM Malones] won sa short film category namin sa Iloilo noong last Sineng Pambansa. Noong napanood namin yung gawa niya, nahulog kami lahat sa upuan. [laughs] Sabi namin, mas magaling pa ito kaysa sa mga existing directors na nandiyan. "[Salvi] is a full-length film based on a short. It will be shown in SM Iloilo and other venues, especially sa mga areas kunsaan identified namin na maraming estudyante." Is it true that there is no censorship in this year's Sineng Pambansa? Mr. Granados: "Actually that is not censorship but ratings. We rate the films. We have an agreeent with MTRCB [Movie and Television Review and Classification Board] na kapag government co-produced films, MTRCB gives the responsibility of ratings to us. We are responsible for rating the films based on existing guidelines that MTRCB follows." Will Lauriana and Lihis be shown uncut in all SM Cinemas nationwide? Mr. Granados: "Yes because the MTRCB [Movie and Television Review and Classification Board] does not allow cutting anymore. Hindi na sila nagku-cut. They just classify you. Kapag sinabi nilang X ka, X ka [which the film is means not suitable for public viewing]. "Ganun na ngayon, wala nang censorship na puputulin [ang mga eksena]. They just classify." What are their plans for next year's Sineng Pambansa? Mr. Granados: "We have a genre scriptwriting contest ongoing this year and we will select 12 from that and produce 12 films next year. We will tap master directors again and some contemporary directors like Lav Diaz...kung mapapapayag namin to make the films. "We want the directors to make quality and wholesome movies na action, comedy, horror, science fiction, thriller or any combination. "Yun ang target namin kasi yung ang napansin namin na bumebenta. Because they are the master directors, they are able to put in [what is needed]...their imagination." He pointed out that in 2014, they will select the script first before choosing the directors as opposed to this year when they selected the directors first then let the filmmakers choose the stories that they want to depict on film. They just requested the director to shoot their films in their respective hometowns. As a result, Maryo J. de los Reyes shot his film in Bohol, Peque Gallaga and Lore Reyes in Negros, Gil Portes in Quezon province, while Mel Chionglo in shot in Lucena. What will be the process next year? Mr. Granados: "Kami we will put up a fund and we will invite co-producers and we will team up with co-producers. Once we have the team, the executive producers will choose the director." How much funding will they give next year? Mr. Granados: "We are hoping to raise P2-3 million. Hindi pa namin alam. It depends sa kita namin sa pelikula dito." The executive director of the FDCP also revealed that the proceeds of the Sineng Pambansa National Film Festival All Masters Edition will go to the building of the first National Film Archives. Mr. Granados: "Sa Tagaytay ito. San Miguel Foundation is giving us property as a donation where we will build our archives. Meron kaming archive na temporary facility sa Cubao. "[Sa Tagaytay facility magkakaroon ng] underground vaults na ten degrees ang temperature. "Our facility now in Cubao has 15 to 16 degrees, which is acceptable." The facility in Cubao currently contains 14,000 film elements. The Philippine Information Agency (PIA) recently deposited its audiovisual collection to the National Film Archives of the Philippines (NFAP). The initial deposit includes various film elements ranging from negatives to prints of 61 titles consisting of LVN's 1939 film Giliw Ko, Gerry De Leon's Sanda Wong (1955) and Lino Brocka's Stardoom (1971) that NFAP will now be taking care of. According to the FDCP executive, the land donated to the FDCP is more than a hectare and they already have a building design. set in their respective hometowns. The proceeds will go to the creation of the National Film Archives to ensure that future generations will be able to appreciate the works of Filipino filmmakers. For screening schedules of the 2013 Sineng Pambansa All Masters Edition, CLICK HERE. At press time, the FDCP announced that there are certain delays in the screening of Badil, Bahay ng Lagim, Eman, and Tinik. In its statement, the FDCP pointed out that "these films are in various stages of post production but will be made available in selected SM Cinemas by no later than this Friday [September 13]. "Thank you for your understanding and we appreciate your continued support."